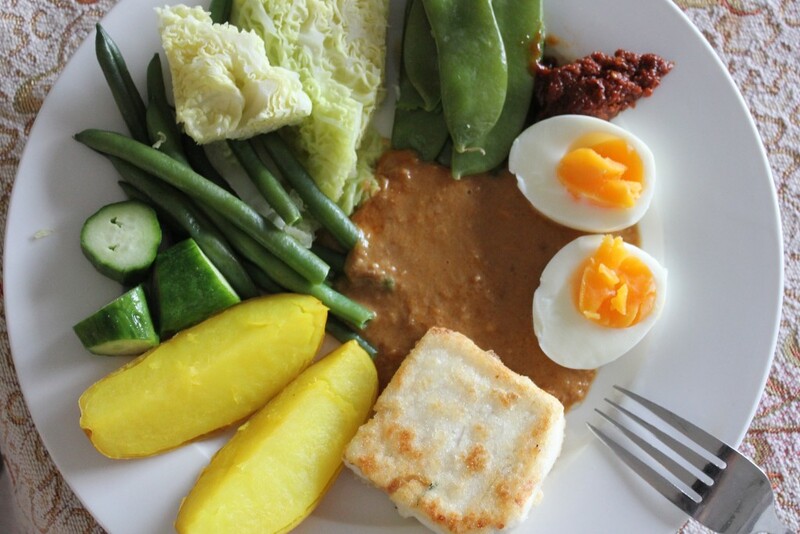 My fond memory of eating gado gado is sitting cross legged on a raised wooden platform on Gili Air, looking out to the blue ocean, slightly salty from a swim and warmed from the sun. Gili Air is a beautiful island off Bali, where there are no cars so the only way to get around is walking, bicycle (although riding on sand is really hard) or horse and cart. We were there 3 or 4 years ago so hopefully it hasn’t changed much, because the simplicity and lack of pretentious posers was a welcome relief from busy, busy Seminyak. The spicy, room temperature salad is a perfect antidote to hot summer days and it takes me back to beautiful Gili Air. Enjoy! Prepare all your salad ingredients. Put everything out on a plate. Devour! Also good the next day for lunch, so make extra. It sauce looks healthy and tasty!! I’ll definitely try to make this, Thanks for sharing.Merry Christmas!!! !